During the brief Space Pirate occupation of the planet Tallon IV, the Pirate Legions started a Metroid breeding program with specimens they had brought from their base on the planet Zebes. 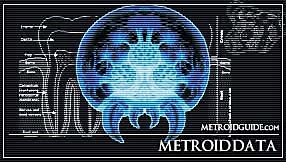 Exposure to the elements of the world of Tallon IV as well as low to medium exposure to a V - Index Mutagen called Phazon, resulted into the development of new life stage in a Metroid’s development; the Hunter Metroid. 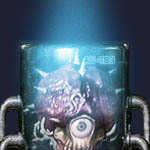 While the Metroids on SR388 molted in order to grow, some of the Metroids on Tallon IV instead expanded their natural body to accommodate larger internal nuclei such as its brain and energy storage organs. Another development was a long tendril on the underside of its body which the Hunter Metroid can use to attack prey from a distance, siphoning its bio energy through this tendril. This makes them far more effective hunters than the first stadia Metroid. In case the prey is more troublesome than the Hunter Metroid prefers, it is known to attack its prey by ramming it with its body into submission after which it continues with feeding. Hunter Metroids appear to be solitary hunters, but they will work together with other normal Metroids and Hunter Metroids to capture a prey. This makes the Hunter Metroid very dangerous to engage. Like normal Metroids its capable of thinking and solving problems, giving the pirates who tried to study Hunter Metroids a hard time to contain them. Even in low level Cryogenic Hibernation Hunter Metroids still seemed to be aware of their surroundings. As the Metroids on Tallon IV were totally different from their ‘relatives’ on SR388, its not clear in what way the Hunter Metroid fits into their society. 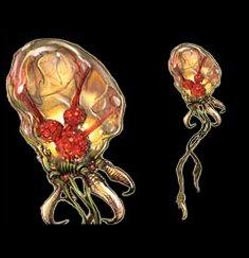 It probably would have taken the position of the Alpha Metroid on Tallon IV if the Metroids had been allowed to continue to breed on the planet.